Earlier this year, MI6 launched an ad campaign to persuade women and people from ethnic minorities to consider a career with Britain’s secret service. The message was clear: you don’t have to be James Bond to be a spy. Another well-established campaign is encouraging more women into science, engineering and technology posts. These initiatives tackle the stereotypes that cling to traditionally male-dominated professions. Some men in nursing are asking for a similar campaign to broaden the appeal of nursing, a profession in which men remain underrepresented. In 2017, 10.8% of registered nurses were men, according to the Nursing and Midwifery Council, making it one of the most gender-segregated jobs in the UK. The figure has hardly changed for years, increasing by only 0.1% since 2006. 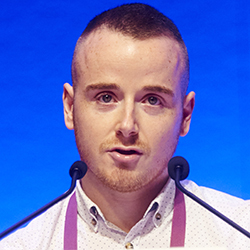 The issue of whether men should be the target of a direct campaign was the subject of a lively debate at RCN congress in Belfast in May. However, the resolution that the RCN develop a campaign to target men more directly was not backed by delegates, who decided that any nursing recruitment drive should appeal to everyone. While disappointed that his resolution was not passed, Mr Ferran is pleased to have begun a debate that has prompted national media coverage on the dearth of men in nursing. He is one of a group of six nurses called Northern Ireland Men in Nursing who are attempting to raise the profile of nursing as a career for men. They give talks in schools about their work, are active on Twitter and are planning to meet officials at the Department of Health in Northern Ireland to discuss the issue. Mr Ferran, a dermatology nurse in Belfast, was 30 when he completed his nurse training. He says he is frustrated that he could have started a decade earlier if he had considered the profession as a teenager. Instead, he was directed towards jobs such as a plumber or builder, and only stumbled across nursing as a career while he was working as a healthcare support worker. Research suggests that men are put off by the traditionally feminine image of nursing, which can be traced back to Florence Nightingale and her team of women tending sick and injured soldiers in the Crimean war. There is also a widely-held notion that women are more nurturing and thus more suited to carrying out personal care. Added to this, some of the titles in nursing, such as matron and ward sister, remain feminine. An unpublished study completed in May and carried out for NHS Education for Scotland found that the term ‘male nurse’ is unhelpful and supports stereotypes. The study, by the universities of Dundee and Edinburgh, the University of the West of Scotland and Robert Gordon University in Aberdeen, found that a higher proportion of male students drop out of nursing courses compared with their female counterparts. The report called for a ‘gender neutral’ nursing campaign. The idea of nursing as ‘women’s work’ and the act of caring as somehow innate rather than skilled, could be hindering the pay of both men and women in nursing. The RCN has recently commissioned research into whether being a mainly female workforce is suppressing nurse pay. Evidence suggests that when the majority of a workforce is female, such as childcare, it is more poorly paid than a workforce of equivalent skill level that is predominantly male. The college is looking at whether nursing is viewed by policymakers – whether consciously or unconsciously – as ‘women’s work’. How to overcome these entrenched stereotypes is less clear. A new nursing campaign for Health Education England aims to appeal to young people aged 16-18, pointing out that nursing can make a real difference to people’s lives, that 94% of graduate nurses are employed within six months, that nurses can work anywhere in the country and that there are career development opportunities such as teaching, research and team leadership. Of the two posters supporting the #knowaboutnursing campaign, one features a male learning disability nurse and the other a female mental health nurse. Neither wears a uniform, both are young, and the posters are clearly intended to demonstrate the diversity of careers in nursing. 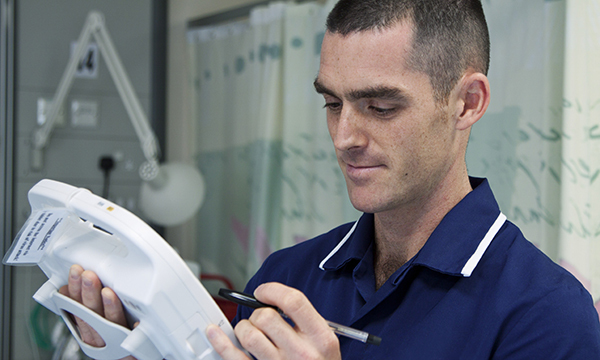 Men in nursing is also one of the strands of NHS England’s perceptions of nursing and midwifery programme, which aims to support recruitment and retention of nurses. About 50 men in nursing attended an event as part of this at the end of May, which discussed how to tackle myths and stereotypes that may prevent men joining the profession. RCN deputy director of nursing Stephanie Aiken says the issue will remain on the agenda at the college, as it clearly struck a nerve at congress. ‘It was clear in conversations around the debate that we need to do further work on recruitment, retention and understanding what motivates people to choose nursing as a career, and one element of that is gender,’ she says. But while men may find themselves in the minority when it comes to the workplace, they may also find that their promotion is relatively swift. A report by recruitment company Randstad in 2016 found a 14% pay gap that favoured male over female nurses. The main cause of this was the disproportionately large number of men who take senior, better-paid nursing jobs. Women account for 77% of the NHS workforce, but hold just 46% of senior management roles, according to NHS Employers. Early research from a study using data on almost 10,000 advanced nurse practitioners found that male nurses are promoted more quickly. London South Bank University healthcare and workforce modelling chair Alison Leary has found men reach band 7 positions within six years of qualifying, compared ten years on average for women. University of Wolverhampton head of practice learning Paul Jackson says attitudes need to change within the workforce to create a more welcoming environment for men. Mr Jackson, who has researched the issue of men and nursing, says more work needs to be done with schools, colleges and universities, including having male mentors and practice teachers. There has been a big push locally from universities and trusts, as well as a national debate about the shortage of men in nursing over the past year, he says. But the focus should remain on the benefit to patients. Many universities are taking steps to promote a more gender-neutral image of nursing. Edinburgh Napier University ensures there are practising male nurses at recruitment events and has hosted visits by children from local primary and secondary schools to the clinical skills centre to encourage a broader understanding of the work of nurses. Meanwhile, Coventry University announced last year a fund of £30,000 to help ten men studying in areas where their gender is under-represented, including nursing, occupational therapy, physiotherapy, midwifery and dietetics. The gender gap on nursing courses is growing, according to figures from the Universities and Colleges Admissions Service. In 2012, 19,475 more women than men accepted places on full-time undergraduate nursing courses in the UK. This number has steadily grown each year, reaching almost 23,300 more women in 2016. Coventry University pro vice-chancellor for health and life science Guy Daly says the intake of men to its nursing courses had stayed fairly static at around 10%. ‘We want to encourage the widest demographic to reflect the people we care for. We have made ten bursaries available as a profile-raising initiative.